CHESTERTOWN — Hundreds of dogs took leaping dives into water, ran through obstacle courses and frolicked as they caught Frisbees during the two-day Adirondack Woof Stock event held this weekend on the field behind the town of Chester Municipal Center. Event founder and organizer Cindy Mead estimated that 2,500 to 3,500 people and more than 1,000 dogs visited the festival over the weekend. 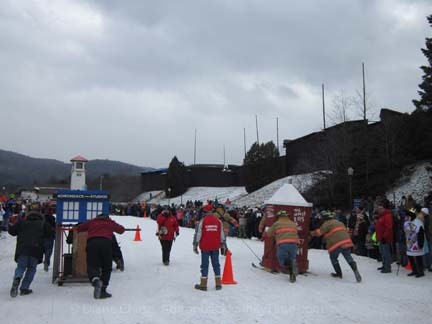 The Almanack covers outhouse races in the Adirondacks. We hope to see you soon out on Brant Lake.